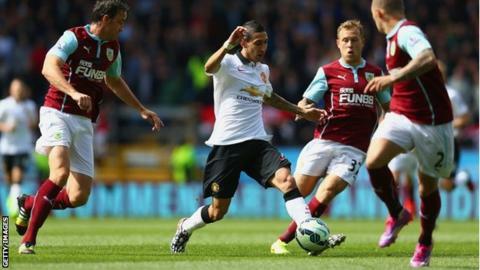 Louis van Gaal remains without a win as Manchester United manager as £59.7m British record buy Angel Di Maria failed to inspire their first victory of the season at Burnley. Sean Dyche's Premier League newcomers fully deserved their point - and were the better side in spells after seeing David Jones strike the bar with an early free-kick. United, who agreed a £13.8m deal for Ajax's versatile Netherlands international Daley Blind before kick-off, showed little sign of getting to grips with Van Gaal's methods and new system as they were uninspired in the face of Burnley's organisation and spirit. Di Maria showed touches of class before going off with cramp 20 minutes before the end but there was a further injury concern for United and Van Gaal as Juan Mata then limped off with a hamstring injury. The presence of Di Maria only underlined the different financial world these two clubs operate in - with the fee paid to prise the Argentina international from Real Madrid outstripping the £45m spent by Burnley in their 132-year history. There was little difference between the two sides in these 90 minutes and United now have only two points from what they would have regarded as a favourable opening three games of the season. Van Gaal remained rooted to his seat in the dug-out, clutching a clipboard for the entire game and there was little urgency on the field either as United struggled for inspiration. Robin van Persie's shot was cleared off the line by Dean Marney and referee Chris Foy ignored late appeals for a penalty when Ashley Barnes blocked Ashley Young's shot. Burnley may not have repeated the win Robbie Blake's goal gave them in this fixture in 2009 but this result could prove just as vital in terms of adding self-belief. On this evidence, a first victory will not be long in coming. For United, with the scale of their ambition, the concerns are greater and time is running out for Van Gaal to add the quality that is clearly desperately required. The favoured three-man defensive system does not look safe in the hands of Jonny Evans and Phil Jones - youngster Tyler Blackett can be excused - and Van Gaal must hope Marcos Rojo's work permit issues are swiftly resolved. In Van Gaal's defence, he is currently without summer signings Luke Shaw and Ander Herrera through injury and they would surely have put some sort of gloss on this insipid performance. With suggestions that the Blind signing may be United's last before the close of the window, there remain real concerns about the lack of an authoritative midfield presence, with Van Gaal reduced to using Anderson as a substitute when he clearly has no place in his future plans. United's team has an unbalanced look as Van Gaal attempts to find places for what seems a surfeit of similar players - with little time to address this problem. Burnley swiftly exposed the deficiencies in the three-man defensive system Van Gaal is attempting to integrate, Jones striking the bar with a free-kick and United keeper David de Gea having to race off his line to block from Lukas Jutkiewicz. Di Maria showed flashes of the quality that persuaded United to part with such a fee with a neat pass into van Persie that brought a fine block from Burnley's former United reserve keeper Tom Heaton. Otherwise this was once again an undistinguished performance. Burnley, perhaps understandably, went into retreat as the game moved on but there was never any suggestion they would come under the sort of siege that was United's trademark in previous years. Their fans were delighted with a point at the final whistle but United's supporters will regard this result as resembling the current condition of their team - namely not good enough. Burnley manager Sean Dyche: "I thought we were very productive in the first half. In the second half we started very brightly and as the game wore on they began to control it better and we just got on the back foot a little bit. "Overall we are happy with a point. We can't be greedy, they're a very good side. "I don't think there's a lack or organisation or energy to the team. It's that quality in the final third that wins you games and we were close again today." "There is no hiding from the fact that Manchester United are not playing well at the moment. With the team they had out, they still had enough to beat Burnley but at the moment it is still work in progress" - Former Manchester United, Everton and England midfielder Phil Neville. On 3-5-2 formation: "I am not convinced. It is spreading nervousness through the back three." Match ends, Burnley 0, Manchester United 0. Second Half ends, Burnley 0, Manchester United 0. Steven Reid (Burnley) is shown the yellow card for a bad foul. Danny Welbeck (Manchester United) wins a free kick in the defensive half. Foul by Steven Reid (Burnley). Foul by Tyler Blackett (Manchester United). Substitution, Burnley. Steven Reid replaces Matthew Taylor. Attempt blocked. Ashley Young (Manchester United) right footed shot from outside the box is blocked. Assisted by Phil Jones. Substitution, Manchester United. Adnan Januzaj replaces Juan Mata because of an injury. Attempt missed. Juan Mata (Manchester United) left footed shot from the left side of the box is high and wide to the left. Assisted by Danny Welbeck. Substitution, Burnley. Ashley Barnes replaces Danny Ings. Attempt missed. Wayne Rooney (Manchester United) header from the left side of the six yard box misses to the left. Assisted by Anderson with a cross following a corner. Corner, Manchester United. Conceded by Matthew Taylor. Attempt missed. Matthew Taylor (Burnley) left footed shot from outside the box is just a bit too high from a direct free kick. Foul by Anderson (Manchester United). Substitution, Manchester United. Danny Welbeck replaces Robin van Persie. Darren Fletcher (Manchester United) wins a free kick in the attacking half. Substitution, Manchester United. Anderson replaces Ángel Di María because of an injury. Offside, Burnley. Kieran Trippier tries a through ball, but Dean Marney is caught offside. Attempt saved. Matthew Taylor (Burnley) left footed shot from the centre of the box is saved in the centre of the goal. Assisted by Scott Arfield. Tyler Blackett (Manchester United) is shown the yellow card for a bad foul. Delay in match Ángel Di María (Manchester United) because of an injury. Attempt missed. Robin van Persie (Manchester United) header from the centre of the box is just a bit too high. Assisted by Darren Fletcher. Attempt blocked. Robin van Persie (Manchester United) left footed shot from the centre of the box is blocked.